Truffles: Hey Mommy, do we have an unlimited data plan? 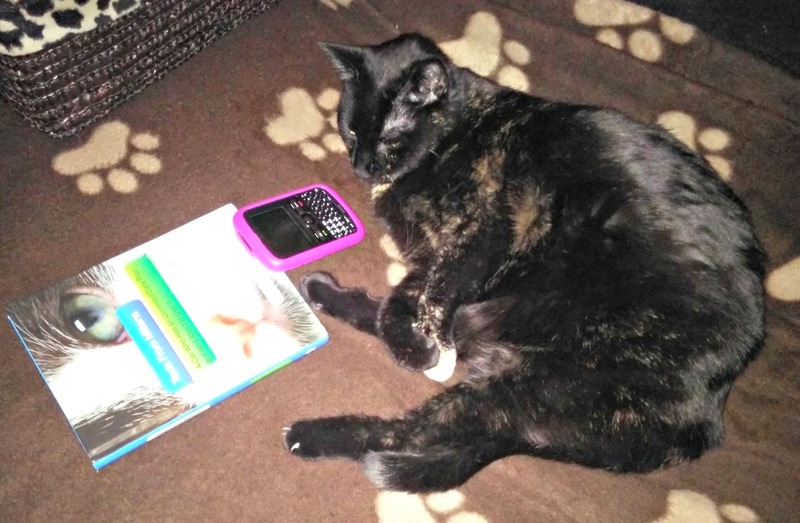 Truffles: I wanna learn how to text like Mittens!!! Sometimes when I'm at work I wish there was a way to communicate with Truffles as she waits for me back home. 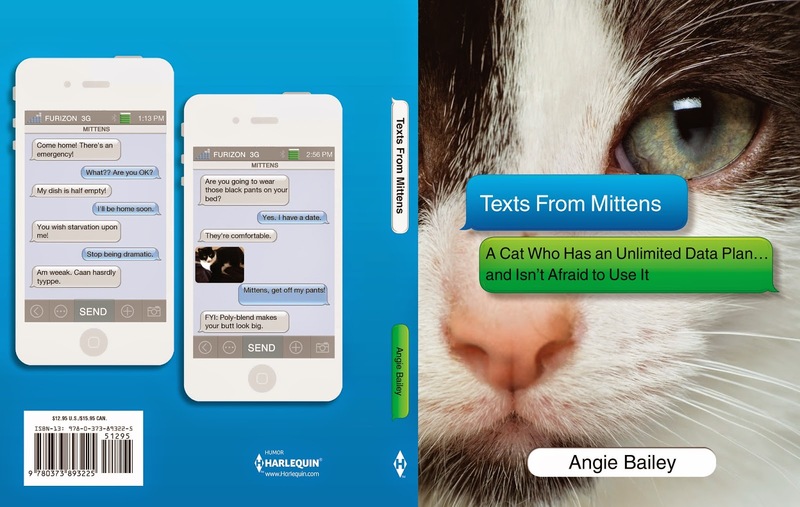 We could be chatting back and forth if she had the ability to text, which is the premise behind Angie Bailey's brilliant Text from Mittens. 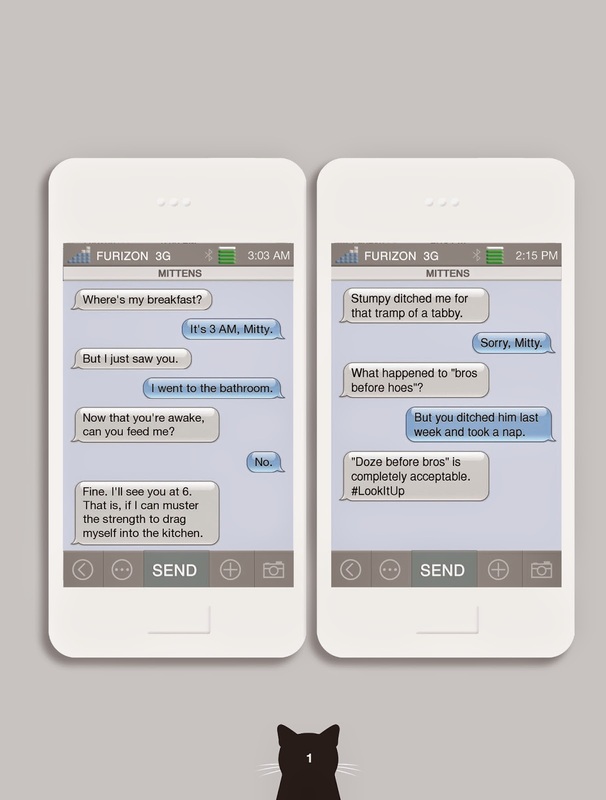 From the publisher: Texts from Mittens is a series of text message conversations between a snappy, self-absorbed housecat named Mittens and his long-suffering human, a single woman who works away from home during the day. Mittens relentlessly hassles his human all day long, while only taking breaks to watch Judge Judy, hang with his best friend Stumpy, complain about the antics of Drunk Patty the neighbor, ask Grandma for money to buy useless items from QVC, and harass the "filthy beast" dog, Phil. Mittens was "born" on Catster.com and has now gone on to star in his very first hardcover book. (When you've caught the attention of Harlequin, you are a superstar!) Every page is a screen shot of a text message between Mittens and his Mom, and more than once I laughed out loud with the realization that these are exactly the sorts of things our cats would say to us if they could. This book is a must have for any cat lover's bookshelf. About the author: Angie Bailey is an award-winning writer and blogger, humorist, and professional member of the Cat Writers' Association. Her primary blog, Catladyland, has won many awards, and her humor writing is featured nearly daily on Catster.com, one of the most popular cat sites on the Web. She loves to photograph her cats in silly poses and sleeps with one eye open. And yes, she has three cats. Texts from Mittens is on bookshelves today and can be purchased from Amazon. Thanks to the nice people at Harlequin I have one hardcover copy to giveaway to a lucky US or Canadian reader. The texts are hilarious! I think the major texts would be about treats and wanting attention. Mitty and friends are always hilarious! That sounds like a cute, funny and must read! That looks like a really fun book. We love Angie - she's SO clever!! They would take over the world. Mittens, and her human Angie, are so funny! Cats will TOTALLY take over the world if they learn how to text. I was on the fence about this book but after reading this review, I definitely want it even if TW doesn’t read books. I’d text Pop about how late TW was cleaning my litter box. Peep #1 won't give me cell phone so I've never learned to text. I'm very deprived, for sure. MOUSES! We already ordered our book! We can't wait for it to arrive! We love Mittens! Looks like a fun book. Love the texts! Truffles, you are a unique cat and so loved by your person for her to be willing to have you text her! I sometimes wish I could text my babies when I'm not home; I do wonder what they do! Thanks for the chance to win! Cute! Way too much effort for my Tobey - plus he's got really big paws. I don't think he could press the buttons. What a great book we would love to read it! if my cat had thumbs, there would be no treat safe from his finding it and eating it..